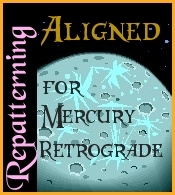 Mercury retrograde in Aires reminds us to be aware of reactivity. Aries is awesome and positive when it’s about activity but in reaction it has a belligerent side for sure. Mercury is communication so we need to be aware of what we say and we can learn a lot about how and who people are when we listen to their reactions during this period. The journey of this retrograde period involves squares to Mars and Saturn in Capricorn suggesting that by making a genuine effort in aid of discipline (not punishment) we could learn something that will make us stronger and more able to defend what really needs defending in a way that is mindful and strong rather than reactive. Easier said than done if you’re a hot headed kind of person but well worth the effort. The alternative is to be frustrated and at the mercy of circumstance. Mercury goes direct on the same day as the New Moon which suggests we will all be ready to get going after April 15th: Full steam ahead. This indicates that we can happily take our time if need be, leading up to that day. The most important day of any Mercury retro period is the conjunction with the Sun which happens on April Fool’s day, the 1st. Possibly the greatest fools will be the ones who don’t take a moment or more to listen. There is always a whisper on the wind when Mercury conjuncts the Sun, something we need to hear even if we aren’t sure what it means at first. I am an astrologer. I love Mercury Retrograde. Especially when I am aligned for it. This entry was posted in General Comments and tagged aligned for mercury retrograde, carolyn winter resonance repattering, julie simmons astrologery, mercury retrograde in 2018, mercury retrograde March 22 2018. Bookmark the permalink.